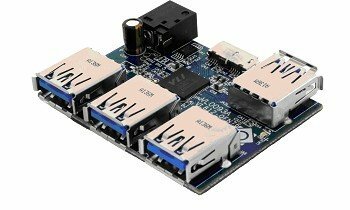 VIA Labs, Inc., a leading supplier of USB 3.0 integrated circuit controllers, today announced its 3rd generation USB 3.0 hub controller, the VIA Labs VL812. The VL812 USB 3.0 Hub Controller utilizes a new low-power design and features an industry-first integrated 5V DC-DC switching regulator, offering a single-chip solution that achieves both high power efficiency and greater system integration for further reduced BOM. In typical configurations, the VIA Labs VL812 USB 3.0 Hub Controller consumes less than 0.5w under load, making it one of the market's low-power leaders. The low operational power consumption of the new VIA Labs VL812 USB 3.0 Hub allows users to attach an external 2.5" USB 3.0 hard drive, USB 2.0 Flash drive, and a USB Mouse simultaneously without the need for an AC adapter, when connected to a regular USB 3.0 port. "The VIA Labs VL812 USB 3.0 hub is a perfect expansion companion for the growing Ultrabook market, which have a sleek form factor but few external ports," said Terrance Shih, Product Manager, VIA Labs, Inc. "It provides Ultrabook users with a wide range of USB connectivity options for peripheral devices without necessitating the need for an additional power adapter for the hub." "We are excited to partner with VIA Labs and integrate the VL812 USB 3.0 Hub Controller into our next generation of USB 3.0 Hubs," said Steven Lu, Vice President of Actionstar. "The high level of integration and low-power design enables Actionstar to create exciting new, highly portable companion products for the growing Ultrabook market."